Brigit's Scraps "Where Scraps Become Treasures": My Creative Time 46th Release Blog Hop! My Creative Time's 46th Release and blog Hop! but first I want to thank you all again for the wonderful comments! Now for my hop project I'm showcasing the Too Cute To Spook set! I used the ghost stamp and die with the pole and sign stamp and beware sentiment from the set. I also used the NEW Stitched Square Dies to create all the inside blocks and frames, such a fun card to make, plus great to use up your little scraps! The paper is Thirty One by Pebbles, it's from last year but I love it!! 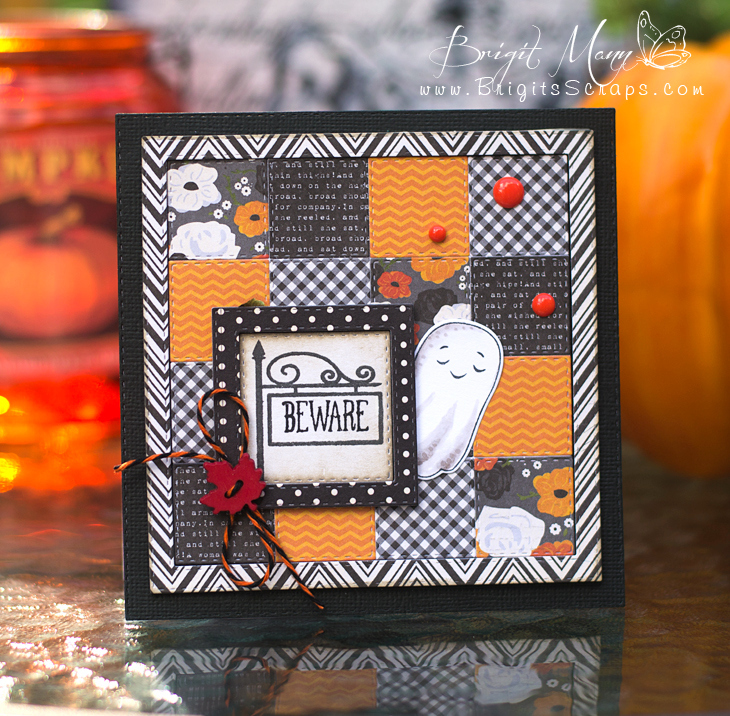 Our "Freebie" for this release is this ADORABLE "Fangtastic Day" stamp and die set. It will be given to the FIRST 150 shoppers! If you are one of the 1st 150 shoppers it will be automatically added to your package at the time of packaging/shipping. Once 150 shoppers come through, the die will be available for purchase. So, if it’s for sale in the store, you are not one of the 150. No exceptions will be made. This freebie die is not a part of the “bundle” and will be sold separately! ***SALE ALERT***ALSO, DON'T FORGET our sale starts RIGHT NOW here:http://shop.my-creative-time.com/New-Release_c40.htm! Use the code: AUGUST2015 to receive a discount off your entire purchase! This sale applies to "IN-STOCK" items ONLY. This sale will end on Friday, August 28th @midnight PST. New to your blog. Thanks for sharing. Super cute card! Fun papers and love the adorable ghost peeking out:) Awesome projects all week! Beautiful card Brigit!! Love how you used the new stitched square dies. OH MY GOODNESS!!!!! This is SOOO STINKIN ADORABLE my friend!!! Thank you for your AMAZING sneaky peeks the ENTIRE WEEK!!! Hello first timer at your blog, super cute. OOH love this card - one of my favorites from the whole week of sneaky peeks! So cute, and so glad I ordered this set!!! TFS! What a great card! Very cute! What a fabulous card! I love that background. Thanks for sharing all your projects this week. Very cute and a clever way to use the stitched square dies. What a cute quilted background to keep your little ghostie warm! Love this card, thanks for sharing your project. OMG Miss Brigit Your card is Awesome I love all the different papers definitely super creative of you and love how you've created with Miss Emma's goodies!! The ghost is so stinkin' cute you totally did a super outstanding creative job!! YOU DO ROCK!! Really really cute for halloween. Thanks for sharing. Wow! Love all the coordinating papers you used on your card.. It looks awesome!! Love the card! Great stamps! Brigit ~ Oh my word this is seriously FABULOUS!! I LOVE everything especially the patch work idea and the papers ~ BEAUTIFULLY done today and all week! Very cute - love the stamp set you used! Adorable card, love the quilt you created. Adorable! Love the quilted background you made with the squares, and the sign post and ghost are the cutest things! Oh my gosh, what a great card! Love how you designed it and the colors are awesome! Your pictures look professional, right out of a magazine spread! the stamps cover a lot - fall, Halloween, and summer. The prehistoric set is fun. Love the spooks. WOW! Adore your card. Love the paper piecing you did and the adorable ghost. What fun new stamp sets! Love your card and all the new products! The theme is one of my all time favorites to craft for! Love the dies you used. thank you these are darling! I absolutely adore everything you make!! That little ghost is just way to cute. Love the patchwork quilt look. Good Job. I love the quilty look of your card...even the stitching! Love the papers too and your ghost is adorable. Such cuteness!! I love this! Brilliant way to use up those pesky scraps!! Love your card! I can't wait to receive my stamps. Just sooo adorable. This is a very beautiful card. What a neat idea to use up some scraps. Love your card. It's sooo adorable! Love how you used the little stitched squares to make your background. This little ghost is just way too cute! Can't wait to receive my set. brigit, I was just now able to look at all of your wonderful projects for this week! you are truly amazing and talented, all are so cute! Adorable! I haven't really used stamps but I think I might need to start a new collection! Oh WOW! This card is stunning Brigit!!! I love...love your background!! Beautiful projects the whole week!!! Such an ADORABLE card Brigit! LOVE the LO and the awesome way you showcased the stamps and dies! Another AMAZING inspiration from you!! Darling patchwork background for your cute card! Love that sweet ghost! Love your paper choices too! Awesome release and this set is my fave! Oh my! What a fantastic card! The background is amazing! Love the little sign too! This card is just adorable, thanks for sharing. This card is too cute! Am ready for fall and Halloween. Amazing card and so super cute - Love the cure little ghost poking his head out around your sentiment!! So very awesome!! What a fun Fall-licious card with all the great Fall colors and paper. Oh this is just too cute!!!! I love the stamp set!!! So adorable! I love your quilted background, and your little ghost is so sweet! Thanks for sharing your adorable card! These images are too cute to spook!! Such a cute card. Love the little ghost. TFS.